For the minstrel matador Juan Batistsa, only one thing holds him back from becoming Spain's most famous singing bullfighter. That "obstacle" is Olimpia, the most beautiful and manipulative woman in all Barcelona. Juan must "conquer" her before the local impresario will put his name in lights. And he's got just three days (and nights) to do it! You'll hail Peter Sellers' conquering comedy genius in this fast-paced farce - and be smitten at the comedic charms of his then-wife Ekland, keeping pace as a pampered princess whose foxlike inituition is somehow always overwhelmed by Juan's ridiculous stabs at suavity. Together they're an irresistible mismatch. And like the chameleon to which he was often compared, the film's finale - an all-time-great sight gag - proves Sellers could turn any color needed to make movie fans smile. The natives are growing restless in the tiny country of Grand Fenwick! There's no indoor plumbing, no money to pay for it and no one's had a hot bath in ages! 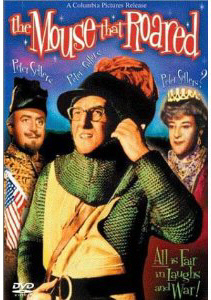 Facing a winter without warm water, the conniving Prime Minister (Ron Moody, Oliver!) convinces the U.S. government to give him a million-dollar grant by promising to use it for Grand Fenwick's space program. There's just one pesky problem: Grand Fenwick doesn't have a space program! But when a local crackpot professor discovers that the region's wine makes radical rocket fuel, the little nation determines to blast its wayinto the space race and land on the moon before the U.S., Russia or anyone else! Get readyfor a spoof on space travel and political plotting that's so funny, it'll have you howling at the moon! Full of "hilarious slapstick moments" (Boxoffice), this lunar laugh-riot is a "delightful farce" (The Film Daily) that's out of this world!